The next Turley cousin get-together is Friday March 31 at 10 am in Salt Lake City. See page 1 for details. Come and bring another family member with you! Saturday Morning Agenda: We encourage LDS family members to attend temple services wherever they reside. We will not arrange organized brunches as we have in the past. If you are in the Salt Lake area, those wanting to participate in a sealing session officiated by Richard E. Turley, Sr., can do so at the Salt Lake Temple. The session starts at 10 a.m. You should arrive at the temple 30 minutes early. Saturday Afternoon Agenda: Family members will meet at the Family History Library in downtown Salt Lake City at 2 p.m. in the main floor classroom A. Two of our family researchers, David R. Turley, Jr., and Mary Ann Clements, will present recent findings about Theodore Turley and his descendants. Afterwards, interested family members can visit the Salt Lake City Cemetery to see the new headstones paid for by our organization. Full details and report from the trip start on page 4. Donations are tax-deductible and can be paid online via PayPal. See page 36 for how to contribute. Have you moved recently? Please keep your contact information updated by submitting email and address changes to wayneturley@gmail.com or turleyfamilyorg@gmail.com. If you receive multiple copies of this email, please respond with your preferred email address. Have fun reading the March newsletter! We have a great family. We’d love to get to know you better too, so please consider sharing something in our next edition! The August Newsletter is available with great information on the Beaver & Minersville trip scheduled for September 23 - 24. Have you donated to the Theodore Turley Family Organization lately? What do you get if you donate to the Theodore Turley Family Organization? •	The honor of being one of the select few to support our organization. We only have 27 paying members in an organization of over 1600. •	Tax deductions. The Theodore Turley Family Organization is a registered non-profit 501(c)(3) organization. All donations are tax-deductible. •	The option to support special projects that are of interest to you. Current projects include the Salt Lake City Cemetery headstones and setting up a website for the organization. Future projects can be anything you can imagine… online libraries, photo preservation, family history research… the sky is the limit! •	Paper copies of the newsletter mailed to you if you desire. There are currently 25 mail subscriptions and 1168 email subscriptions. •	Benefiting from field trips and family gatherings across the country to meet extended family members in person. Are you ready to find a new friend? So what can you spare today to help us advance our organization and reach our goals of sharing information and bringing the extended family together? Please donate whatever amount you are able. Everything helps! And any donations made between now and Labor Day will be matched by one of our family members… so your dollar will have twice the impact if you make a donation now. Please send a check made out to the “Theodore Turley Family Organization” to our Treasurer. Send a payment via PayPal to turleyfamilyorg@gmail.com. We invite you to read about your extended family members and learn more about your heritage in the newest Theodore Turley Family Organization newsletter. If you have difficulty opening the newsletter, right click on the newsletter link to open it in a new window. Leadership Meeting in 2 Weeks: Come to the next leadership meeting! We have a new meeting location! We will be meeting on Friday April 1st from 10 a.m. to 12 p.m. at the Eagle Gate Social Room at 109 East South Temple in Salt Lake City. Everyone is welcome to attend. Celebrate Theodore’s 215th Birthday at the Temple on Saturday April 9th: Don’t miss this opportunity to gather with family members in your area – Salt Lake, Payson UT, Mesa AZ or Los Angeles. Full details start on page 3. Contact Information: Have you moved recently? Please keep your contact information updated by submitting changes by email to wayneturley@gmail.com or turleyfamilyorg@gmail.com. If you receive multiple copies of this email, please respond with your preferred email address. Email delivery of this newsletter is provided to all family members for free. If you or someone you know would like to receive a copy in the mail, we ask for a $10 annual donation to cover printing and mailing expenses. Please mail donations to our Treasurer made out to “Theodore Turley Family Organization”, c/o Carolee Pyper, 595 Wilford Ave, Murray, UT 84107. I hope you enjoy all the great stories & news in the March newsletter. Any contributions to share in the next newsletter would be appreciated by June 10, 2016! Come to the next leadership meeting! We will be meeting on Friday October 2nd from 10 a.m. to 12 p.m. at the Ensign Stake Center church building (135 A Street, Salt Lake City, UT) on the lower floor, west side of building. You may bring a snack to share. Everyone is welcome to attend. Please keep your contact information updated by submitting email changes to wayneturley@gmail.com or turleyfamilyorg@gmail.com. If you receive multiple copies of this email, please respond with your preferred email address. I hope you enjoy all the great stories & news in the September newsletter. Any contributions to share in the next newsletter would be greatly appreciated by Jan 10, 2016! Come to the next leadership meeting! We will be meeting on Friday April 3 at 10 a.m. at the Ensign Stake Center church building (135 A Street, Salt Lake City, UT) on the lower floor, west side of building. Lunch is included. Everyone is welcome to attend. I hope you enjoy all the great stories & news in the March newsletter. Any contributions to share in the next newsletter would be greatly appreciated! Come to the next leadership meeting! We will be meeting on Friday October 3 at 10 a.m. at the Ensign Stake Center church building (135 A Street, Salt Lake City, UT) on the lower floor, west side of building. Lunch is included. Everyone is welcome to attend. Please keep your contact information updated by submitting email changes to wayneturley@gmail.com or turleyfamilyorg@gmail.com. I hope you enjoy all the great stories & news in the September newsletter. Any contributions to share in the next newsletter would be greatly appreciated! Read the September Newsletter for the full story of how this picture was discovered. Thank you to David Turley (David – David – Richard – Edward – Edward – Isaac – Theodore) for sharing this exciting find with the family! In June, 1839 Theodore Turley built the first Latter-Day Saint home in Nauvoo. Through the home does not remain, the spirit does. 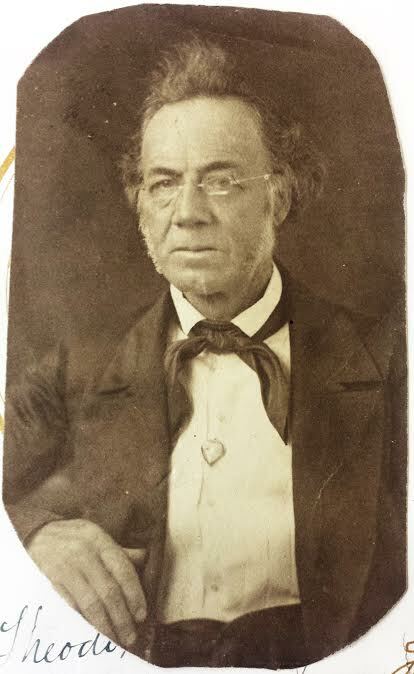 Theodore Turley was representative of so many early settlers who planted roots deep in Nauvoo’s soil. A unique opportunity to commemorate Theodore Turley’s efforts, as well as the efforts of the thousands of early saints who settled here. 10:00 AM at the Turley Site (The corner of Hyde and Water Street) - Commemorative tree planting (more information available at visitors center) and talks by Richard Turley Jr. and Susan Easton Black Durrant. Lunch buffet at Nauvoo Café following 10:00 AM meeting. Morning tour with Susan Durrant, 9:00 AM, Women’s Garden, by Visitor’s Center. 2:00 PM Endowment or Baptism Session at the Nauvoo Temple. (Meet in chapel or baptistery by 1:30 PM, temple clothes available to rent.) If there are baptisms from our group, we are requested to provide additional endowed adults for help in the baptistry.